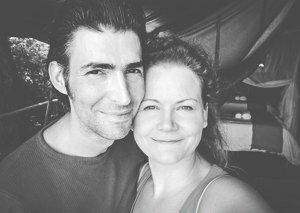 For everybody who can imagine, and who has the same dream, but who doesn’t dare – or just as an inspiration – I would like to tell you about our dream wedding in the Seychelles at the wonderful and famous beach Anse Source d’Argent in La Digue. It has always been our dream to marry at the beach. Luckily, for both of us! And now our dream has come true! We could choose between Thailand (a lot of complicated paperwork), the Maldives (the marriage is legally not recognized), Mauritius (the marriage is legally recognized but much too touristic) and the Seychelles (passport and birth certificate, the marriage is legally recognized). 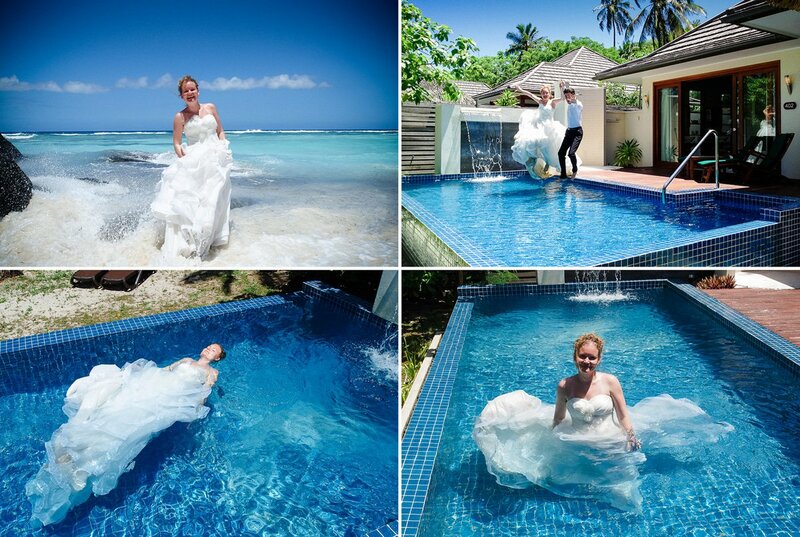 So the Seychelles should be the location of our wedding. From Mahé we took a little cute airplane from Air Seychelles to the isle of Praslin. Sometimes in the cockpit a window opened during the flight, but this did not disturb the pilots at all. Fresh air does not harm. So they closed the window again and flight on! Flight time: ca. 20-30 min. Oh yes, the wedding dress. Actually it is not allowed to take it in your hand luggage. Of course I did it nonetheless. During the check-in luckily nobody has paid attention to the garment bag. And then, as I had expected, the stewardess has turned a blind eye and I always had a good space for the dress. In the second airplane there was an extra wardrobe for the wedding dresses. Like this I did not even have to iron the dress at the hotel, everything was still perfect. At Praslin we have been brought by private transfer to the other side of the island to the landing stage for boats. Like this you can already get some impressions of the landscape and can have a chat with the local driver in order to get some tips. By the way all the transfers have worked out just fine. Driving time: ca. 15-20 min. The last tour was the boats trip from Praslin with wonderful sunset to La Digue. Driving time: ca. 15 min. After what had seems like 24hours trip we finally reached the hotel. And that was worth the effort! Le Domaine de L’Orangeraie is the perfect hotel for the wedding dream. Wonderfully romantic, super personal and just made to feel comfy. The hotel itself does not plan weddings. This is made by Mason´s Travel on the island. Of course one must also have a talent for luck so that there is no ebb when the ceremony takes place. Then our ceremony would also have taken place at one of the tourist places. But we were lucky. And another tip: Normally ceremonies take place at 11 in the morning or at 1 in the afternoon. But then there is a lot of activity at the beach. So this is why we wanted our wedding to take place at 4 in the afternoon. First of all there are nearly no tourists at the beach, secondly you have a great sunset and thirdly you can sleep in and have a relaxed breakfast. This has also gone right. In the morning of the wedding day the room maid has decorated everything very lovingly with flowers. In the evening a champagne bottle and a fruit plate were waiting for us, even though we have not had the honeymoon package. Really great! At twelve noon the hair styling and makeup started. The stylist was booked by Mason´s Travel. You cannot choose yourself the stylist, so you will have to have faith. The same for the bridal bouquet. I chose from a few options by email my favorite bridal bouquet. It should look similar then. But you cannot choose it exactly the same. And in the end my bridal bouquet was just perfect. A thousand times more beautiful then on the pictures. White beautiful franchipani flowers! During the time when I was being styled, Marcus could relax at the pool. Then at 3 a.m. we drove by ox cart to the beach. By bike it takes about half an hour to the beach. By ox cart it takes nearly one hour. We owe this wonderful ox cart to Danny from Mason´s Travel. A well tempered, cuddly guy, with the heart at the right place. He made our dream at the dream beach come true. From left to right: Our marriage witness Solange, the civil registrar, us and Danny, our best man. As we were all alone there, we could choose two marriage witnesses. We chose two great employees from Mason´s Travel. But we could have equally well picked the driver of the ox cart. Normally the ceremony takes about 20 min, but our ceremony took about 50 min. No mass-processing and absolutely personal. After that we had a photo shoot with our photographer Laurent. Unfortunately there was not very much time left because the sunset is at 5:30 p.m. to 6 p.m. And then the sun sets. The wonderful pictures were taken by the French photographer Laurent Levy. He lives at Praslin, the neighbor island of La Digue. I am more than happy that I found him while researching the internet. By the way it was him who suggested a ceremony at 4 p.m. because of the much better light. These Polaroids that were taken by Laurent were sent to our families by cheap island post and like this they got to know about our secret wedding. In the evening we had a wonderful candle light dinner at the Hotel Le Domaine. The place and the menu can be chosen one day before. We chose a quiet, isolated place in the beach sand near the water. We could also have chosen a place next to the pool. Nearly the whole personnel has congratulated us during that evening. The service is very personal and it does not seem hypocritical, but it comes from the heart. You simply feely so comfy. 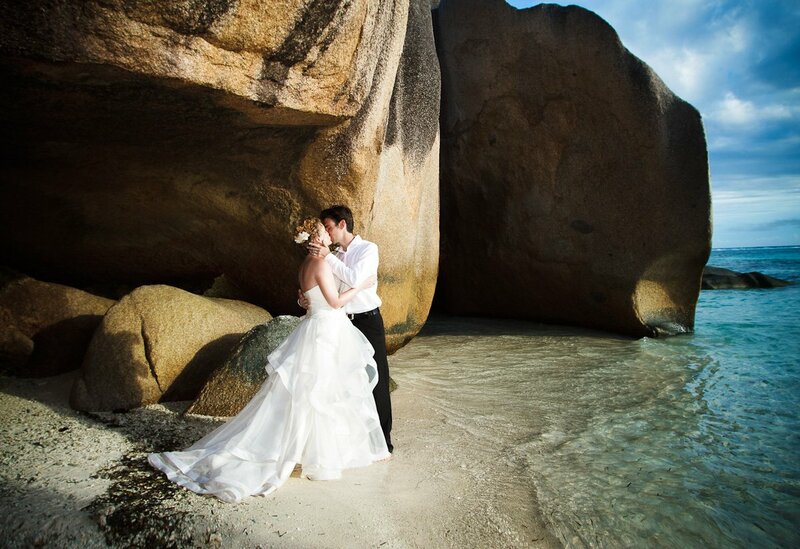 La Digue is in our opinion the perfect place for a wedding. You feel like in a different world. Our dreamlike beach wedding will always be unforgettable for us. We can only warmly recommend to every couple to flee from the whole wedding and family stress at home and to have a dreamlike wedding on this dreamlike island. For us it was just absolutely perfect and incredibly romantic! Here is a little excerpt from our wedding video. It was made by Veronique, the video partner of our photographer Laurent. Wonderful, we think! We spent the honeymoon on the dreamlike island Silhouette in Hilton Seychelles Labriz Resort & Spa. The perfect place for Trash the Dress! Afterwards the dress was clean again. Voyage planning: Whether the wonderful honeymoon or the unforgettable dream wedding at the beach – I help you with the travel planning and travel bookings! 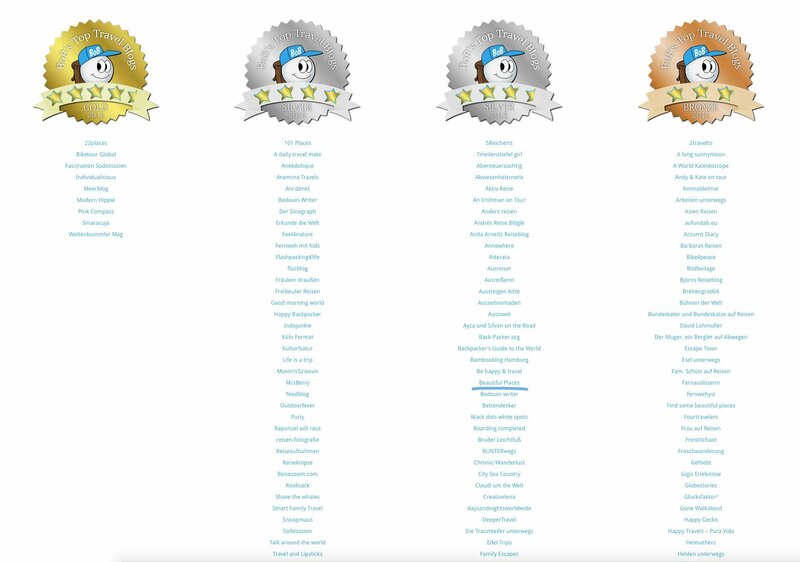 Just write me an e-mail with your ideas and we’ll find the perfect trip for you! Wedding package: Coordination, ceremony and apostille, beach wedding (at the hotel or Anse Source D’Argent or Anse Severe), ride by ox cart decorated with local flowers, palm leaves, table decoration, bottle of champagne and wedding cake, wedding bouquet, makeup and hair styling, pavilion at the beach with stakes and white canvas. Laurent is super congenial, absolutely professional and really relaxed. In Mahé and Silhouette it is raining the most often. During our 2 weeks journey we have had only one rainy day in Silhouette. Maybe your wedding dream on an island at the beach will also come true. We wish it for you! If you have any questions, you are welcome to ask us!